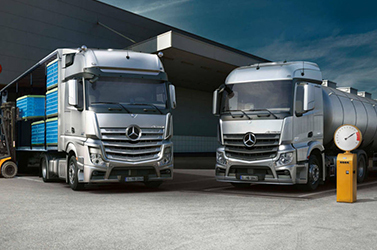 The new Actros. The new dimension in comfort. The redeveloped Actros gives completely new meaning to concepts such as freedom of movement, sense of spaciousness and ambiance without ever losing sight of the driver's daily routines. All seats in the new Actros have been completely redesigned. The result: the adjustment range for the height as well as for the fore and aft position is greater, the controls are intuitively arranged and easily visible, and the seat cushions, having gained a full 40 mm in width, set a new standard in long-distance transport. The new Actros impresses with significantly reduced total costs. From the first day onwards. 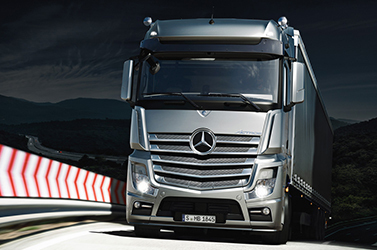 When developing the new Actros, we called every aspect into question. The result: a reduction in fuel consumption. And particularly low total costs thanks to a range of closely coordinated services tailored specifically to the Actros. All for a single goal: to increase your profitability. With up to 7% less consumption with Euro V and up to 5% less with Euro VI the new Actros makes pioneering fuel savings possible in comparison with its predecessor. 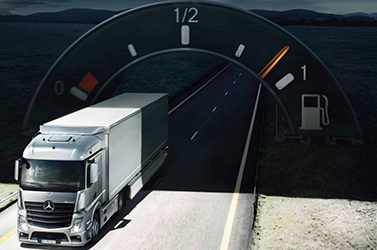 Impressive driving dynamics - the new Actros drives and steers easily, safely and effortlessly. Precisely tuned drive train configurations, spontaneous power development, increased driving stability, improved steering characteristics, and not least, numerous assistance and safety systems - all of which make the driver's task noticeably easier and provide a brand new driving feel. Actros Loader and Actros Volumer. So you can reach your payload and volume capacity limits a bit later in the game: wth the new Actros Loader and Actros Volumer, you have two genuine specialists going to the starting post for you with the capacity to handle much more - as standard.